warming reduces the humidity of the descending air, which results in few clouds and low humidity in the anticyclone. Cyclones that form over warm tropical oceans are called tropical cyclones (they are also known as tropical storms or tropical depressions). Tropical cyclones usually move toward the west with the flow of trade winds. A tropical cyclone that drastically increases in intensity is known as a hurricane when it occurs in the Atlantic Ocean or adjacent seas. To be classified as a hurricane, a tropical cyclone must produce winds over 74 miles (119 kilometers) per hour. Hurricanes usually generate off the coast of West Africa and move westward toward Central America and the eastern United States. They increase in size and strength until they reach land or more northern latitudes. In addition to high, sustained winds, hurricanes deliver heavy rain and devastating ocean waves. In the western Pacific Ocean and adjacent seas, a hurricane is known as a typhoon. This word comes from the Cantonese tai-fung , meaning "great wind." A well elucidated article.I'm now well placed to explain the whole concept to my students. are there any anticyclones and cyclones in other bodies of space? Is there some another reason that the cyclones attract the surrounding air?? which one is worse? anticyclone or a regular tornado? Is it posible for the cyclones and anticyclones to occure at same time,and same place?. Anticyclones only occur in the southern hemisphere, and cyclones in the northern. In that case, no, it is not possible for them to both occur at once @Samuel chiwaulah. Also, tornadoes are much more devastating than anitcyclones, in fact, anticyclones often bring good weather @Connor. I love this site its very intersting and I really enjoying it pls I need more explanation about an eastely wave, airmasses & fronts. and how they occur in that weather tropical producing? system? Best Description of Cyclone and Anti-Cyclone i have seen so far! Thank you. That's not the case. Anticyclones and cyclones occur in both Northern and Southern hemispheres. I feel that this should have more information. I need 45 facts for a project, and so far this isn't going well. But I'm glad to see that the information given to me is very helpful! 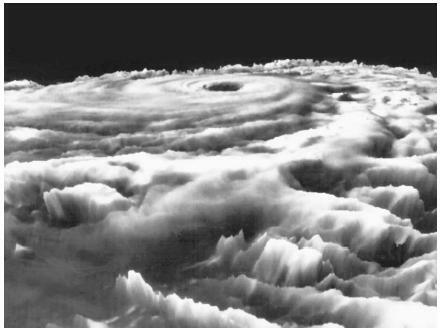 For all the people talking about how cyclones form, tropical cyclones develop from the large-scale clusters of thunderstorm cells that are often witnessed over tropical oceans. They get their energy from the evaporation of surface water with a temperature of more than 27°C. I basically copied this sentence word for word from another website, pardon my copyright. Can you please tell if during a cyclone air moves from high pressure to low pressure or from low pressure to high pressure. Are Anticyclones and normal Cyclones opposites? They spin in different directions but is that the only thing they are opposites for?